Org Junkie’s Tips for Parting with Your Clothes + Free Printable! Two years ago just before I moved provinces I tackled my closet BIG TIME giving away 108 pieces of clothing!! There is nothing like the motivation of moving to put a fire under you to get stuff done. 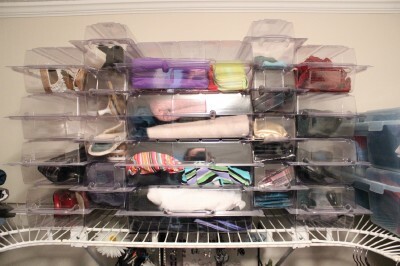 When we moved into our new home I then blogged about my new closet and how I organized it. That was a year and a half ago and since then my closet has continued to evolve and change in order to maximize space and the efficiency of how I use it. You might remember this post I did singing the praises of thin hangers which I am still loving by the way. In the last couple of weeks though I knew I needed to once again do a big tackle on my closet. How did I know? Because every time I walked into my closet I would immediately get annoyed and grumpy. Clothes were everywhere and I was having trouble finding what I needed because there was just too much stuff stuffed in. However I did what I know many people are guilty off. I walked out and did nothing only to be annoyed all over again the next day. I don’t have the time or I’ll do it later were just a few of the lines that repeated over and over in this big head of mine. Then one day I went in and decided to do just ONE thing. 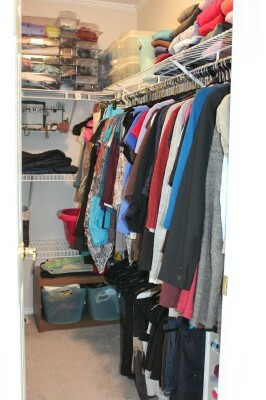 I wouldn’t worry about the whole closet at this point, but I could take 5 or 10 minutes to do just a little. I’ll just hang up all the clothes not on hangers I decided and do the rest later. Well you know what happened don’t you? As I was hanging up those clothes I came across a few things I no longer wore or loved. And then I came across a few more and then a few more after that. Before I knew it stuff was flying out of that closet so fast. I hit the zone. There was no stopping me once I got going. Toss, toss, toss (that’s my most recent purge pile above). A half an hour later, I was done. Not just that ONE thing that I had originally set out to do but my whole closet. IN 30 MINUTES! Seriously why do we do this to ourselves? We put up with being annoyed day after day after day which, let’s be honest, plays out in so many other areas of our lives when we could easily nip the problem in the bud once and for all. I know this, you know this but we still convince ourselves it’s going to take forever. We convince ourselves we don’t have the time but with all the time we waste just thinking about doing it, we could have had it done. So because I had no idea before I started that I’d be overhauling my entire closet I neglected to take a before picture. However here are some after pictures though so you can see how it’s changed from when we first moved in. 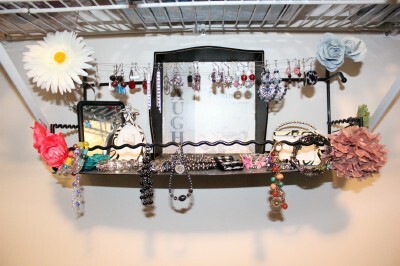 This is my BelleDangles Jewelry Organizer. 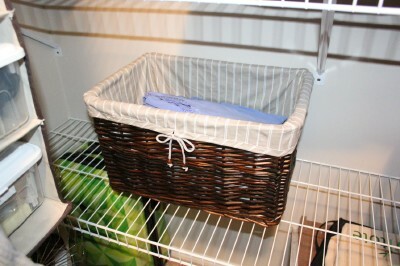 I found this great basket on clearance and it currently holds my summer tank tops but that might still change. This fantastic organizer on my top shelf is from a company called Neat Containers. These are very cool for shoes, purses, wallets, scarves, slippers, bathing suits, etc. They are plastic bins that slide in and out like drawers. I like the way they use up vertical space that would otherwise be wasted. And in case you missed this the first time I shared it, I’m going to share my 11 tips for parting with your clothes again. 9. You don’t have to do it all at once. Try organizing in stages and be motivated by your success. One day you could do shirts, the next day shorts, etc..
And just in case you need a daily kick in the pants reminder, here is a copy for you to print out and stash away in your closet if you need to 🙂 Click on the link below for the pdf file. Hope that helps in your quest to do some serious clothes purging soon!!! 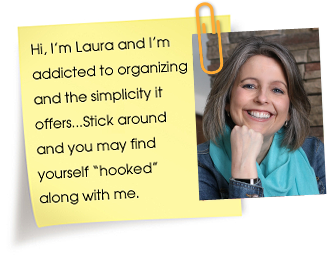 What organizing task have you been putting off for a long time? 24 Responses to Org Junkie’s Tips for Parting with Your Clothes + Free Printable! LOL! My sister is gonna hate me for following you tomorrow! I just printed out your great printable and will hand it to her with an innocent smile when I see her. Thanks so much! Just took a bunch of clothes over to a re-sale shop yesterday … and the ones they didn’t want, I walked down 8 storefronts to a little church thrift shop and they were happy to get my donation! Even though they were once loved, these threads held no big thrill for me and I was happy they were going to go to new homes. The closet is lighter, there are fewer things to look at earlier in the morning, and I love what I see when I slide open the door. Ok, you are seriously motivating me now. I totally agree with the idea of giving away something if I haven’t worn it in a year – why is this so hard for me??? I also love how you mention to just stop keeping an item if it annoys you to wear it. 🙂 I have a few items that I think I might wear next winter even though I haven’t worn it for the past four winters. This has to stop. A few years ago, I re-did my hangers as well. I bought the thin hangers for my whole closet as well. 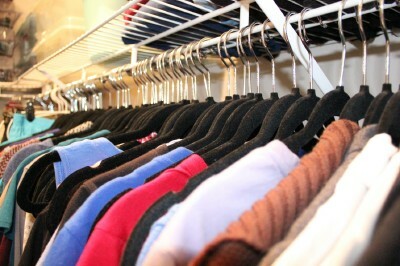 It really makes a difference having the same hangers throughout your closet. That is so awesome, I can “feel” your enthusiasm in your words. Love it, you go girl!! Look into your local organizations that help out single mothers – my church has a fabulous single moms sunday school group and people within the church will donate clothes and the ladies in the class come up to the church on a saturday and get to take what we think we will wear. Do any of those rules apply to shirts signed by famous people? Thanks for this post. Just what I needed. I have been annoyed with my closet for over a year now. These tips are awesome! Exactly what i need! Just tell me what to do and how to determine what to get rid of. Any ideas on good places to donate clothes? That seems to be something that holds me back personally. I desperately need to purge clothing. But my struggle is a practical one. I had a baby 9 months ago and I’m expecting another in January. So the one year and one in, one out rules don’t apply and trying on clothes won’t work for MANY months, but I don’t feel like I can keep everything, since my wardrobe now includes maternity and postpartum sizes. Do you have any tips for women during their child- bearing years? Hi Tiffany, yes this is a pretty common problem. The main thing I recommend for clothes you want to keep but don’t fit is to not give the things you aren’t wearing prime real estate space. Store these things maybe somewhere else if you can. One of the best places is to use shallow totes underneath a bed and then only keep what you have the room to store. Laura, what about the clothes that doesn’t quite fit yet because you had a child a year ago and still working on dropping those remaing 10-15 lbs? Store them somewhere out of the way if possible. Think under the bed for instance. Just don’t give clothes that don’t fit prime real estate space. Hi, I really appreciate your wisdom regarding sorting guidelines. My problem is what to do with the clothes once I decide I probably won’t wear them. I have a public relations type job, so I invest a lot in my clothes and shoes and I just don’t know what to do with the I haven’t worn them in a year pile. I wind up putting them into shrink bags and they go from one closet to the garage, but I would like to have a more permanent “new” place for them. Any suggestions as to what to do once I remove the clothes?